I recently spent some time with a staff member at the Ozark Literacy Council of Washington County. The gentleman actually called on me for a work-related meeting, but we ended our visit with my education about the organization and what they do for our community. Since September is National Literacy Month, I thought this would be a great opportunity for me to share what I learned. I was surprised to hear that the Ozark Literacy Council is celebrating its 50th anniversary this year, and it's the oldest council in the entire state. They primarily have focused on the education of adults, both native English speakers and ESL students, but are now seeing the increased need for addressing literacy in a "family approach." Tutors at OLC can teach basic reading skills or even with a specialized focus on reading for job applications, health or banking literacy. I've also learned that more than 36 million adults in America cannot read, which is really a shocking statistic. This week is being recognized as Adult Education and Family Literacy Week to raise public awareness of the problem we face in our country. In addition, Friday, September 25th, is the national annual giving day that encourages people in the community to make a donation or even sign up to volunteer as a tutor at their local literacy organization. Please consider helping out in any way that you can. The services that OLC provides are free. Ozark Literacy Council can be reached at 479-521-8250 or www.ozarkliteracy.org if you need help learning to read, want to make a donation or if you would like to volunteer some time to helping others. I have been reading for as long as I can remember; it has always been one of my favorite things to do. I am fortunate that my children also have the same passion for books as I do. In fact, the annual book fair is going on at school this month (Coincidence? Maybe not). The kids have pulled out the flyer and put an X on nearly every book for us to purchase. 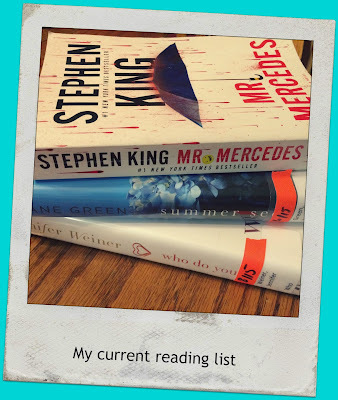 I think books are definitely our thing--and Shopkins--but that's for another blog post. If you need some fun entertainment for your family this weekend, I have the perfect suggestion for you! This Sunday, September 20th, is Funday Sunday at The Jones Center in Springdale. This is the day that the community can visit and use selected amenities for FREE! 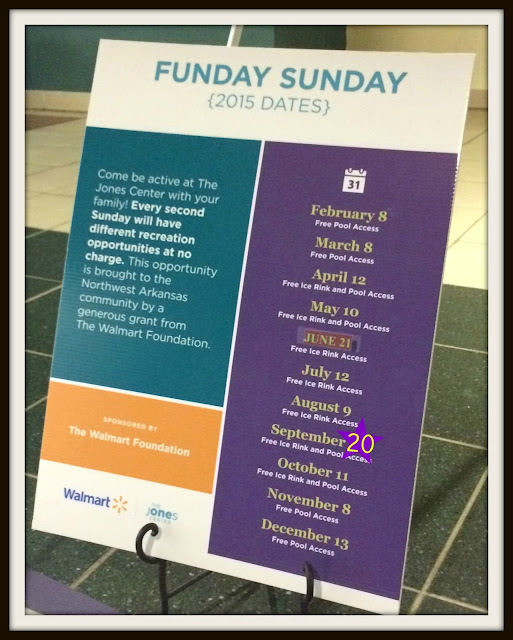 Funday Sunday is a monthly event at The Jones Center, and activities vary from month to month. The designated activities for September are FREE skating at the ice rink and FREE access to the swimming pool. As you know, my family has spent a lot of time doing both of these activities over the past year. I can't say enough good things about The Jones Center and all of the fun family activities that they provide for our community. If you've never been, I encourage you to visit on a Funday Sunday, or any other time when you only have to pay a small access fee. The membership fee is really reasonable, too. Fitness classes are even included in the cost! If you can't make it this weekend, there are two more chances to attend Funday Sunday this year. 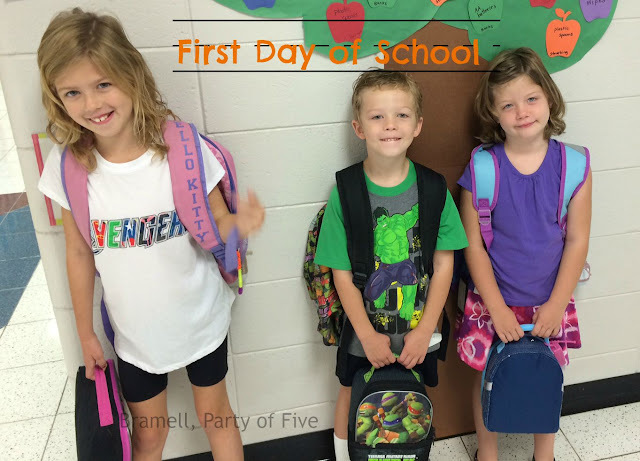 This week marks the 4th week of school for my kids, so I thought it would be a good time for a quick update on how it's been going. For me: It's going surprisingly well. This mama shed no tears at all when the littlest ones went off for their first day in the big, scary school. This was a relief, after spending all summer in a tizzy about the "to separate, or not to separate" internal tug-of-war concerning the twins. I discussed it so much with them, that when drop off day finally came, I hardly even got a wave from either of them. I comforted myself knowing that they could play together at recess every day to soothe their lonely, broken, separated hearts. HA! That lasted all of ONE DAY. For real, I've asked them every single day if they play together at recess--and every single day the answer is "No." So, what shall I worry about now? For Boy Twin: After the 3rd day of school, he retreated to the couch to cry every morning because he didn't want to go to school. His complaint: "School is too long. Why do we have to go EVERY day?" That pity party didn't last long when I told him that's the rules and I don't make the rules. Why else would I go to work every day? For fun? By the 3rd week of school he was excited to tell us about all the new words that he'd learned to spell in kindergarten; words like "P.E." and "D.J." (his new friend in class). 'Atta boy! Also, not to brag or anything, but he's been blowing me kisses every morning as he walks up the sidewalk to school. I'm sure the other moms understand and are not mad at all that we hold up the drop off line every day. For Girl Twin: This girl is like a steel vault; she won't give us any information about what she's doing or learning in class. Either she's really bored, or she is running the show and doesn't want us to know it. (I think I know which.) Either way, we are thrilled that she has the same teacher that Big Sis had in Kindergarten! It's a little different, though, because she is teaching a K/1st split class this year due to enrollment being high in both grades. Yes, the class is half kindergarten and half first grade. Girl Twin is doing great in there and we're excited to see her learning. I guess hanging out with the first graders is really advancing her skills because last week she told me: "2 + y = 30" in a very factual manner. I had no idea they were learning algebra already! She also instructed me to stop putting "love notes" in her lunch box, which nearly broke my heart. We are in a great place right now. We love our school, love all of our teachers and love learning all the new things. There is a strange peaceful feeling in our home that I haven't felt before. Is this what it feels like to not have babies anymore? Big kids rock!